Cross Cut shredders cut the papers into small pieces, the cutters are made in sudh a manner that it is able to cut not only vertically as in strip cut machines but horizontally also thus making the papers into very small pieces. This is very good for security as the A4 sheet is now impossible to join again. 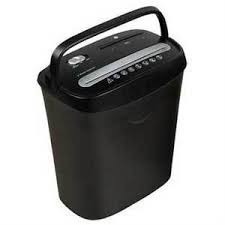 Almost all shredders are cross cutting now and are available from us, Some famous brands are - GBC , Fellowes, Intimus and Kobra. 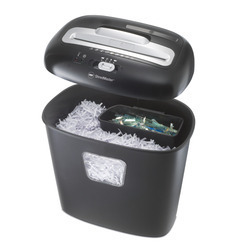 Paper jams are the #1 frustration among shredder users. 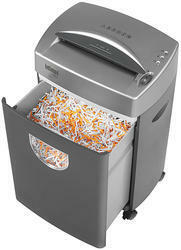 The Strip cut shredder delivers three levels of advanced jam prevention with the patented 100% Jam Proof System. Level One prevents overfeeding by measuring paper thickness via a sensor in the paper entry. Level Two powers through tough jobs caused by wrinkles or folds that may occur as paper is shredding or will auto reverse cleanly. Level Three maximizes productivity by providing instant feedback as to whether or not you are within the recommended sheet capacity. 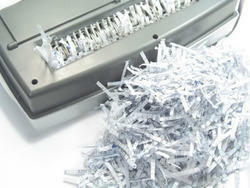 Contact us for any strip cut shredder and you will get it, wherever you are. 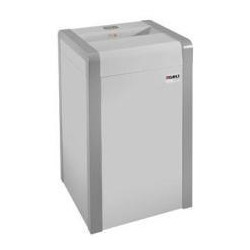 Our Cross Cut Shredder are known for its power and waste capacity, these high security paper shredder provides a practical solution for accommodating the shredding needs of even the busiest offices. 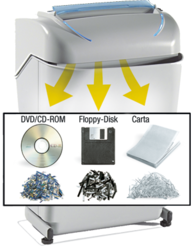 These are attractive in design and large waste bin make this a nice addition to any large office, copy room or communications center where high capacity shredding is needed. These are available at very reasonable price. Dimensions (h x w x d) 34" x 21" x 19"